We live in a world and age where everything moves at the speed of light around us and in order to keep up we often feel that we have to match that speed mentally and physically. You may even have a practice of meditation to help calm your mind but your body may still fidget, your nerves may twitch, random places begin to itch and so on. Keeping your body still during meditation is an underrated and less talked about part of the practice that deeply enhances your meditations. You can train yourself to sit in complete stillness overtime. Challenge yourself to start with being perfectly still for 1 minute a day, then increase to 3 minutes and within a couple of weeks you will be able to sit still for 5 minutes. Increase your time in stillness gradually to be able to sit 15 minutes a day in complete stillness. When you master the art of stillness you will soon realize that in order to keep up with life you simply have to sit and let it all come to you. There is no chasing, no running, no scheming or planning. Sit still, get clear, go within and let go of all the conditioning that has been programmed into you to do more, be more and achieve more. A tantric necklace is not just another piece of jewelry or mala but a tool for spiritual awakening that has long been used by yogic masters of all traditions. It enhances meditations, opens the third eye, brings mystical powers, prosperity, countless blessings and increases one's consciousness. The longer you wear it, the more its powers become interwowen into your auric field. Tantric necklaces are composed of powerful geometric shapes each vibrating a specific part of creation and resonating a sovereign vibratory frequency wihtin their design and stone selection. 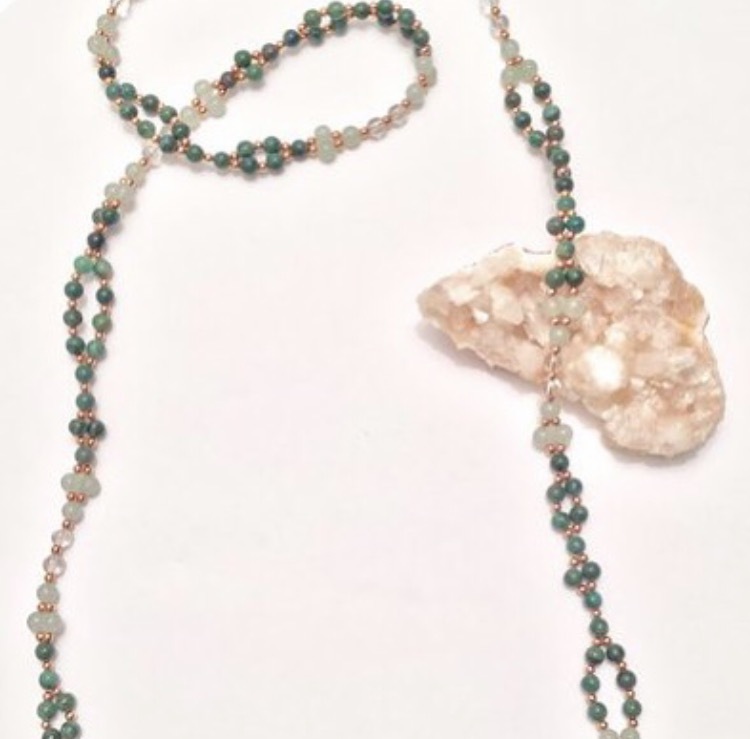 The wearer benefits as the aura of the tantric necklace is interwoven with the aura of the wearer thereby strengthening, purifiying and protecting their energetic field. The first full moon of spring is a reflection of all of nature coming to bloom and an abundance of flowers blooming everywhere even in the deserts. Tonight, simply allow yourself to feel the moon’s energy so you may see similar changes in your own life. The Pink full moon in Libra tonight is a portal to love and heart opening. It's a time to believe in fairy tales and enchanted romance. Venus has been in retrograde since last month and if you were able to learn the lessons she had to teach about conquering your fears, self love and surrender then you are primed to enjoy the benefits of this full moon's energy and step into the next level towards sacred and divine unions in all of your relationships. Joy and abundance will also be blooming so you can breathe with more ease going forward. After a couple intense weeks of darkness, Mother Moon will be wrapping us all in sheets of loving energy and light. Allow yourself to release old wounds, be open to love and renewal. Spend some time in yoga, meditation or journaling visualizing exactly the kind of future and relationship that will support your soul's mission on this planet. For a couple of decades I struggled with being a vegetarian back to eating fish or chicken because I wasn't eating properly and my health and energy struggled. I finally decided that I would study nutrition to understand what my body needed exactly in order to thrive while living sustainably and heeding the call of being a conscious human being. We've never been taught how to eat a healthy balanced vegetarian meal. The USRDA which has a vested interest in factory farming and is backed by Big Food is ran by a kind of political totem which favors the bottom line over your health. The marketing of unhealthful foods and trends including "The Paleo Diet" and many others fads that tout a heavy meat biased guideline and corporate food marketing are now finally a major source of controversy and linked to many health issues and cancer. We ask You to be with us, Gods, Goddesses, Spirits and Ancestors, so that together we can all celebrate the Spring Equinox. We welcome the fresh growth that is all around us. Thank You, Deities and Spirits of the Earth, for waking and growing once more. Thank You, Deities and Spirits of the Air, for sweeping in the bright, clear winds to refresh our minds and make us ready for work and growth. Thank You, Deities and Spirits of Fire, for warming the Earth and waking the ground. Thank You, Deities and Spirits of Water, for the sap rising and the leaves unfurling. Thank you, spirits of our home, for helping us to cleanse, clean and organize the space we share. Thank you, our Ancestors, you who have seen these cycles so many times before, for guiding us through the dangers of birthing something new into the world. Thank You, kind Gods, Goddesses, Spirits and Ancestors, for the many gifts of Spring. Please bless the land, so that She may grow and thrive despite the many obstacles we have placed in Her way. Please bless the butterflies, bees and all the creatures that are waking from their Winter sleep. Please bless us here as we set our minds to cleansing our hearts and working towards a new future. Please bless us all, so that we may see the World with new eyes and grow to be kinder to each other and to the Earth on Whom we all depend. Thank You all for hearing our prayer. May You in turn be joyful and blessed in your lives.